Rupinala pass Tsum valley Trek with Manaslu larkey pass is known as a complete hidden valley Trek in Manaslu Region. 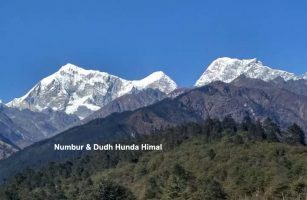 Rupinala Trek is a complete camping Trek still and non touristic non crowded trek.Tsum valley Trek is another less touristic Trekking in this region.Rupinala pass Trek lies within the Gorkha district.Rupinala Trek offer you en amazing mt view of Boudha Himal 6672m,Himalchuli 7893m,Kutang Himal 6238m,Rani Peak 6693m,west peak 7540m further more peaks.Rupinala pass Trek start from Barpak after driving from Kathmandu 9-10hrs drive then you walk through the Rhododendron forest and pine trees.In this region inhabited by Gurung people and Tibetan people.After Nyak Rupinala pass trek is combine with Tsum valley or Manaslu larkey pass trek. Rupinala pass Tsum valley Trek with Manaslu larkey pass is itself long days trekking in Manaslu region.Tsum valley Trek starts after Nyak.Tsum valley Trek offers another Tibetan village ,their cultures, lifestyle, farming , ancient trade route to Tibet, Old monasteries and view of Himalchuli,Ganesh Himal 7422m, pastureland and Milarepa cave.Tsum valley trek is know Lokpa to Mu Gompa.when you come back to Lokpa then the trail combine to Manalsu Trek.Manaslu Trek very popular Trek among other treks.Rupinala and Tsum valley Trek Rupinala pass Tsum valley Trek with Manaslu larkey pass is a great opportunity to virgin Nature and Tibetan Culture exploration Trek.Manaslu Trek offer you larkey pass,8th highest mt Manaslu 8163m in the word,Annapurna II,Himlung,Cheo Himal,Ratna Chuli,Larkey peak,Namrung Himal further more peaks. 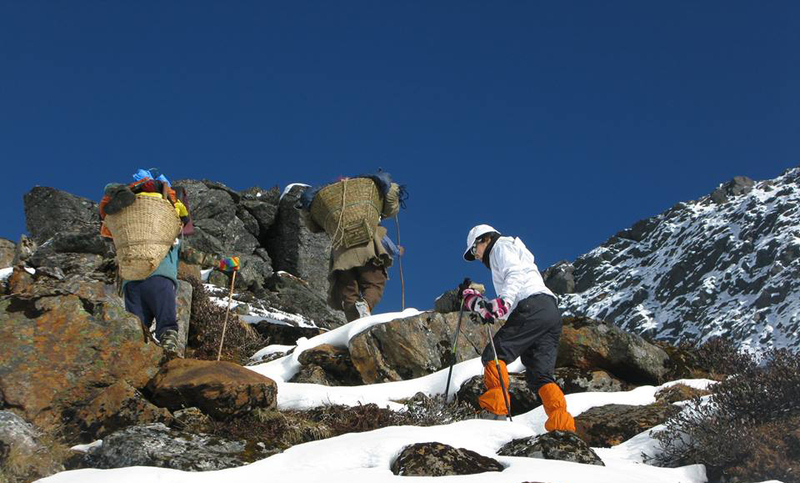 -Rupinala pass 4720m,Tsum valley ancient Trade route and Larkey pass 5160m. -View of Mt Manaslu,Ganesh Himal,Boudha Himal further more peaks. -Gurung Tibetan village,Culture and their lifestyle. 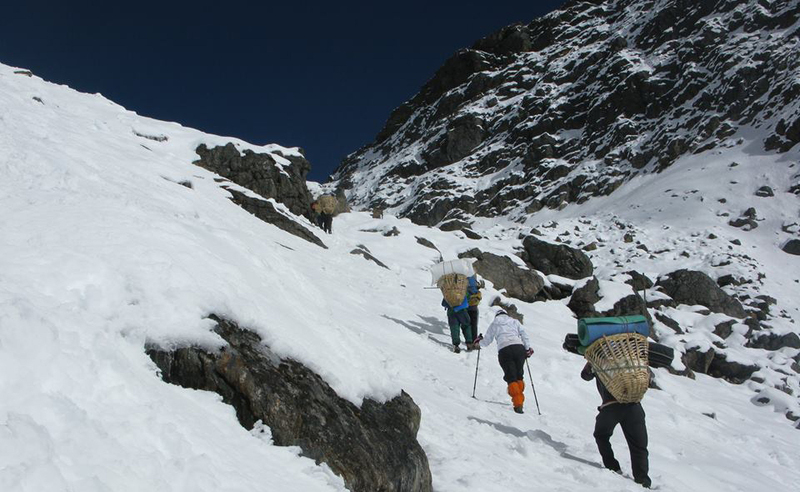 -Most popular Manaslu Larkey pass Trek. -$70 per person for 7 days (Sep-Nov) After 7 days $10 per day per person. -$50 per person for 7 days (Dec-Aug) After 7 days $7 per day per person. 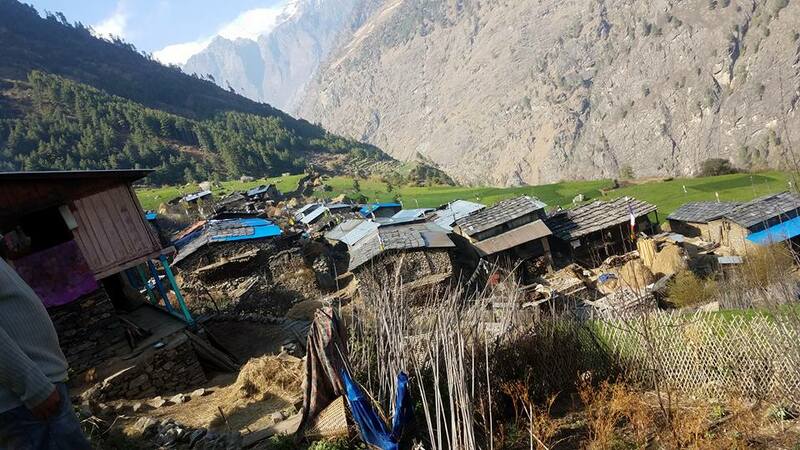 -MCAP $30 per person (Manaslu Conservation Area Project) You most entry your permit at Machha Khola and Jagat, if you do not have then you should pay double at Police Check post. -ACAP $ 30 per person (Annapurna Conservation Area Project) You most entry your permit at Dharapani. How about For solo Trekkers trekking permit? 2 persons are require to obtain Trekking permit in Manaslu region.Trekking is issued by Trekking Agency.If you are solo travelers and enthusiast to trek in this region , we join for your Trekking permit but you need to pay for plus Trekking permit charge. 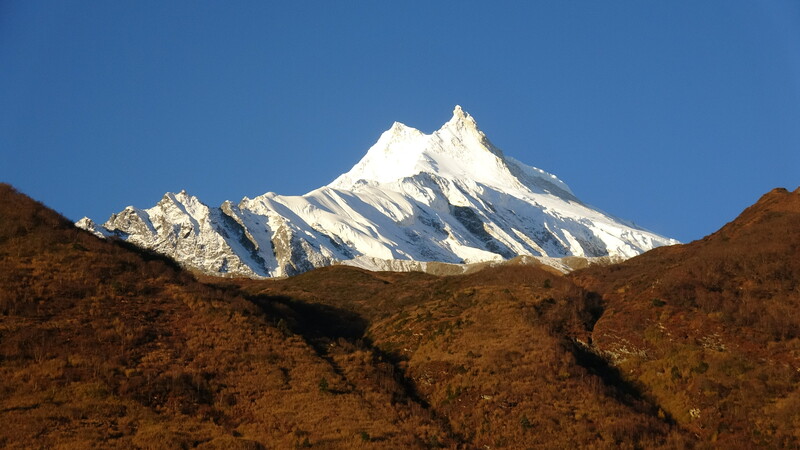 When to Trek Rupinala pass Tsum valley Trek with Manaslu larkey pass? -Rupinala Trek is completely Camping Trek.During the camping Trek we serve you meals in Tent by our Camping professional cook and sleep in Tent.You will get mattress, pillow and Hot bag in Tent. Expect Camping Standard continental meals, Tea, Coffee, Milk, Hot Water, Hot Chocolate etc. -Tsum Valley Trek is Lodge.At Mu Gompa expect simple room and Meals. 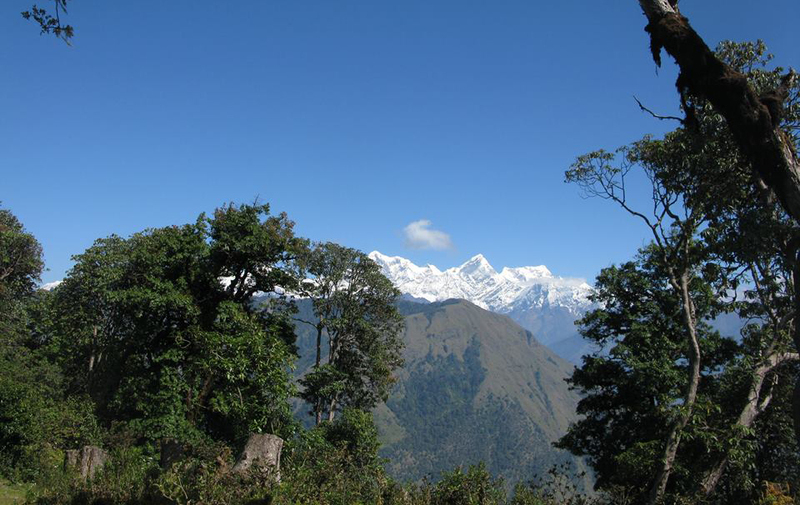 -Manaslu is lodge Trek.At Dharmasala expect simple room and Meals. 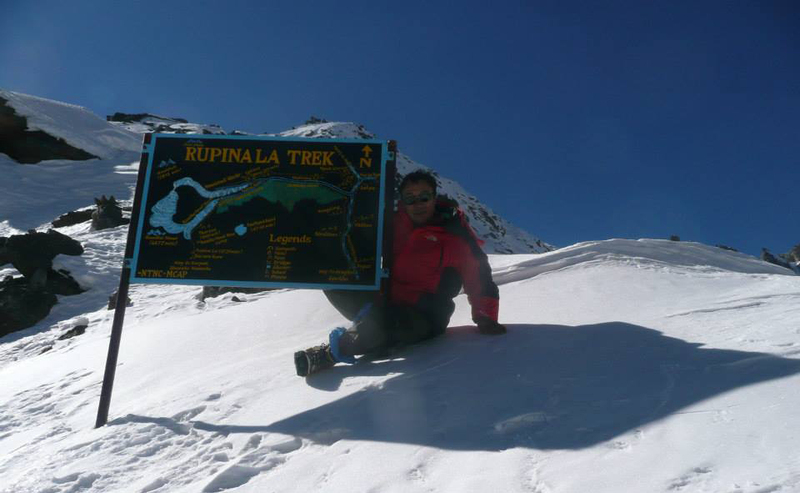 How difficult Rupinala pass Tsum valley Trek with Manaslu larkey pass? 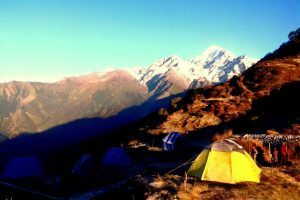 The Trek is considered as adventure Trek with two passes and more than 23 days walking.This is combine Trek .Rupinala is camping Trek.You have to sleep in Tent and pass the high passes. Physically need be fit for walking and ready to sleep in Tent and simple lodges at the some places. Prepare your Sleeping bag, Down jacket, Trekking boot ,Trekking shoes, socks, Trekking Map,Sun cream, sun glass, woolen hat, Sandal, soap, Head light, T-shirt, Trekking Trousers, Trekking Rucksack, Rain coats, medicine kit and your personal essential things what you need in your daily life. Trekking is 100% safety if you are physically fit for walking. During the camping trek you will have camping standard meals by our Camping professional cook. And you will have professional Trekking Guide,Portes.After Rupinala trek you will sleep at lodge and you will get menu choice meals as you like. During your Rupinala pass trek we will provide you solar power for your mobile and Camera batteries charging along with NTC/SKY network mobile for an emergency call.After Rupinala pass Trek we will get electricity or solar power at Lodge for charging. We highly priority to our staffs and clients for their safety and secuty. 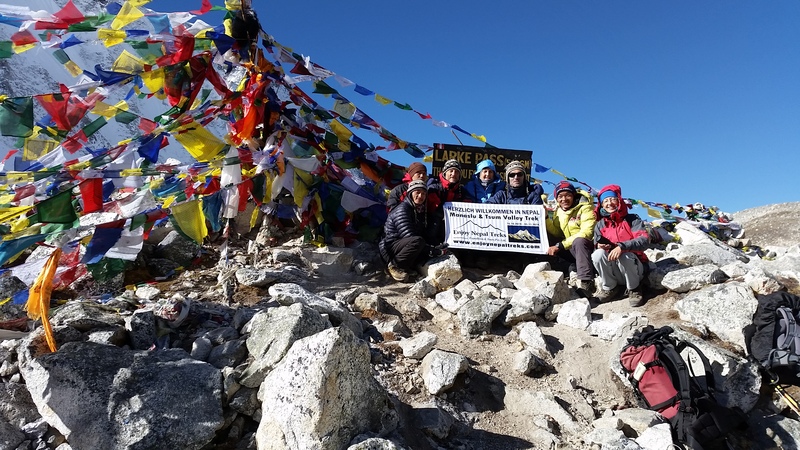 Our Trekking Guide and cook are professional, knowledgeable ,Experienced with trained. They have insurance for trekking incase of accident. we can rescue our staffs in case of emergency. Likewise, we provide good Trekking equipment to Staffs. Day 03: Kathmandu –Gorkha Bazar-Barpak 1900m. Day 05: Gaikharka 3200m.-Rupinala Phedi 3800m. Day 07: Rupinala Phedi 3800m. –Rupinala pass 4720m.-Boudha Himal Base Camp 3600m. Day 08: Boudha Himal Base Camp 3600m.-Chuling Khola Kharka or Jhon khark 2960m. Day 09: Chuling Khola Kharka or Jhon khark 2960m.-Nyak 234om. Day 11: Nyak 234om.-Chumling Village 2386m. Day 12: Chumling Village- Chhokang paro 3031m-Rachen Gompa 3240m. Day 13: Rachen Gompa 3240m.-Nile 3361m.-Mu Gompa 3700m. Day 16: Chhokang paro 3031m.-Lokpa 2240m. Day 17: Lokpa 2240m.-Deng 1875m. Day 18: Deng 1875m.-Namrumg 2605m. Day 19: Namrumg 2605m.-Lho 3170m-SamaGaun 3530m. Day 20: SamaGaun 3530m.-Samdo 3870m. Day 21: Samdo 3870m.-Dharmasala 4480m. Day 22: Dharmasala 4480m.-Larkey pass 5160m.-BhimThang 3710m. Day 24: BhimThang 3710m.-Goa 2515m. Day 25: Goa 2515m.-Besisahar 760m-Bandipur. -Meals 3 times a day with Tea, Coffee, Hot chocolate, Hot milk and fruits during your Trek. -Trekking Guide, Trekking camping cook and porters with their insurance. Today we prepare your Trekking permit.You have a free day in Kathmandu.You can do as you like. Or you can do sightseeing around Kathmandu (Monkey Temple , Boudanath Stupa, Pashupatinath Temple, Bhaktapur,Budhanilkantha,Kumari Temple Durbar square but on your request if you want. After your Breakfast at 7:00 am drive to Gorkha bazar by private jeep about 6hrs.The place Gorkha is known as historical kingdom related to last ruler King Prithivi Narayan Shah (1743Ad-1768AD). Shah dynasty had ruled 2009 years at this place. (1559 -1768).The first king was Dravya shah 1559-1570.Still there are durbar square and Museum. If you are interested do sightseeing then continue drive to Barpak Gurung village. Early in the morning you will get wake up tea likewise washing bowl and camping standard breakfast,tea,Coffee,Hot Chocolate,Jam,Honey,Hot water,Hot Milk etc in your dinning Tent. After breakfast start your Trek. Rupi nala phedi is called as Sanrung Kharka also this is considered as base camp of Rupinala pass.You have short walking day while comparing with yesterday. Today we will make lunch camp. You will get camping standard meals in dining Tent. Walking trail is long with passes.You will have to walk uphill to Rupinala pass 4 hrs continue. When you get the top of pass, you will enjoy the view of Boudha Himal 6672m,Kutang Himal 6238m,Himalchuli 7893m,west peak 7540m and Rani Peak 6693m.After enjoying the panorama descend to Boudha Himal base camp 3600m.On this day, we do not make hot lunch, you will get pack lunch with hot water, tea, Coffee etc. Note: Prepare well equipment like warm jacket, woolen hat, Gloves, walking steak, drinking water, sun glass, boots , socks and your personal first aid kit. It’s a picturesque hidden valley. walk through the fantastic beautiful Glacier, trees, forest and cross the several small stream.On the way you will see Sheep pasture,Thick trees and tall Grass with Chuling glacier,Gorkha Himal,Boudha himal,Himal Chuli and Peak 29. The first trail goes up and down then 700 m steeply down dujima kharka.Like this, the path runs to the Budhi Gandaki valley green meadow slopes.Today also you will see Boudha Himal,Rani Peak, Himal Chuli,Dwijen Himal 5521,Shringi Himal 7187m,and Lumbu Himal 4835m.Then descend to Nyak which is picturesque Tibetan village. You are starting Lodge Lodge trek from Today.Your Camping staffs will back to Kathmandu and you enter to Tsum with your Guide and porter.The first descend down and cross the Budhi Khola (River) then follow the zigzag path up and downhill to Lokpa. Lokpa is Lunch place.It is small village with 2 Guest houses. 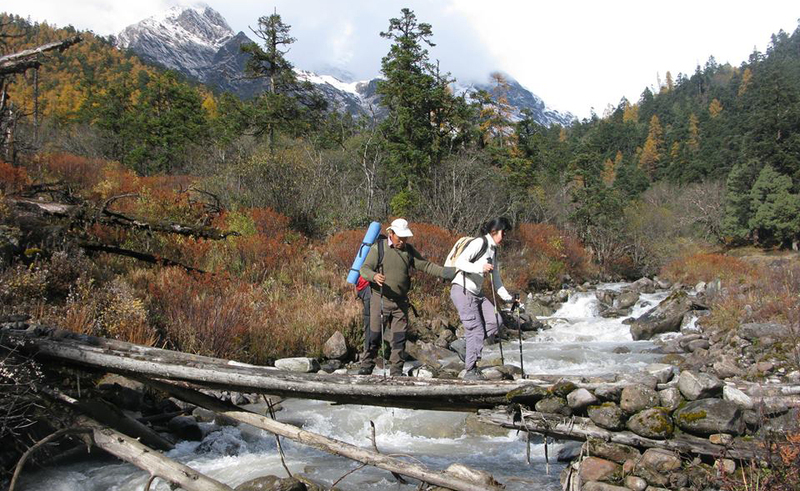 After your Lunch walk continue to Chumling 3 hrs approx by crossing the another Khola (River) and suspension bridge. 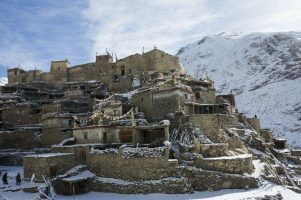 Chumling is another Tibetan village.Village is very beautiful with Buckwheat, Potato, Barley, maize farming and with Peaks Panorama. Your trekking day begin with the view of Ganesh Himal 7422m and other peaks.The first, you walk flat by crossing the suspension bridge and villages then finally ascend to Chhokang Paro.From here you will see the another view of Mt Himalchuli 7893m.Chhokang paro is your Lunch place after 5 hrs walking .Entry your Trekking permit here at Police Check Post. Then walk continue 2hrs approx to nuns Rachen Gompa. You walk to Mu Gompa 5 hrs approx by passing the several Tibetan villages.Today expect simple meals like Nepali Dalbhat at Gompa.It means there are not lodges availabilities still. After lunch walk uphill to view Point .From the view point explore the Tsum valley and way to Tibet trail.2-3hrs Approx up and down. In addition, you will see Yaks and wide pastureland. Walk back down to Chhokang paro through the Milarapa Cave.Do not walk to Rachen Gompa,Cross the River near the Phurbe Village 3251 before lar and trail follow way to Milarepa Cave.After visiting Cave walk continue to Chhokang paro.You get here nice lodges and foods.On this day you pass the several Tibetan villages and enjoy the great landscape again. Today, You can relax your day. (get shower) Or if you want make hiking day way to Ganesh Himal . Do as you like and as you comfort. 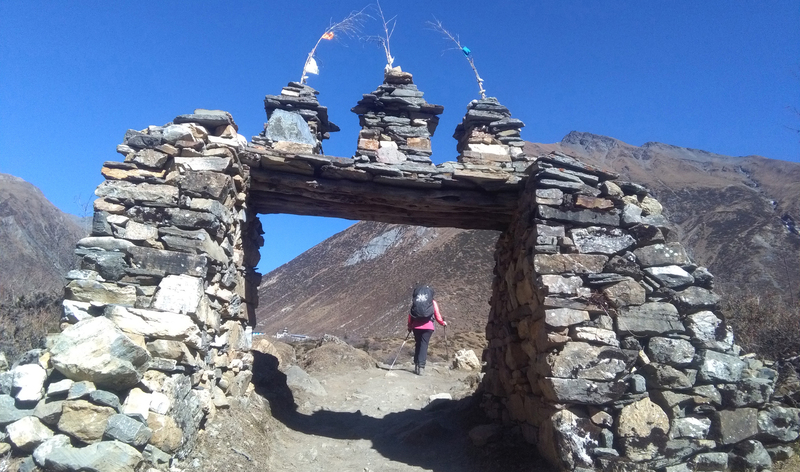 Walk down to major trail Manaslu and cross the Suspension bridge then follow the trail to Deng trough Nyak village and Pine trees with rewarding beautiful Sringi Himal 7161m.Today you are ending Tsum valley Trek and starting Manaslu Trek.You have lunch camp today with short walking. Afternoon you have time for relax. It comes several times uphill and downhill on the way to Namrung.Aso you cross the suspension bridges and you walk by passing the several Tibetan villages. On the way you will see Tibetan flags, Mani stone, their Houses and farming. 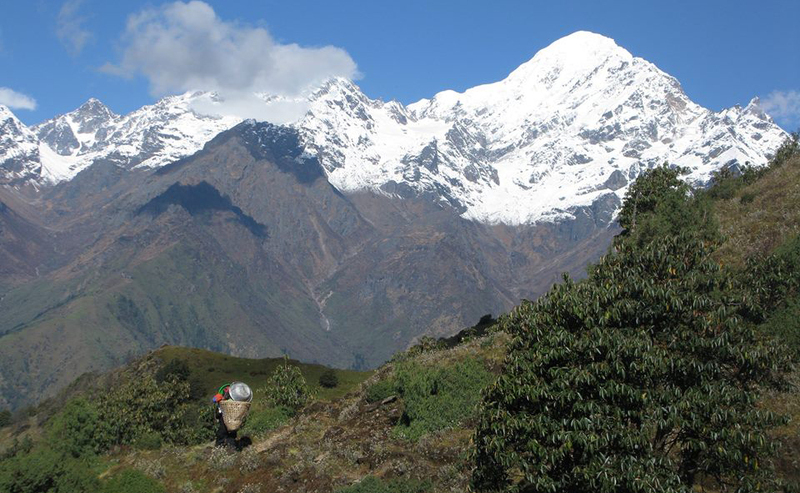 Expect extraordinary vegetation while getting closer to Manaslu. You walk by passing the Tibetan Gompas and Stupas until to reach Lho. From here you have a magnificent View of the Manaslu (8163 m), beautiful Village of Lho and Visit the Monastery if you have an interest. Then walk continue to Syala,it is an another spectacular view point of Mt Manaslu and other peaks.After enjoying the the view again walk continue to SamaGaun.It is a big Tibetan village in the lap of Mt Manaslu. Capture 360 degree panoramic view. Today,It’s your short walking day to samdo from samagaun. walk by enjoying the Mt Manaslu panorama, Glacier and pastureland. It takes about 3hrs to Samdo. After you have time, so if you want you can hike up to 5098 m.Lajyung la pass Tibet trade route.or safe energy for Larkya pass. Walk to Dharmasala 3-4hrs approx through the Larkya Bazar.At Dharmasala you get very small Room for an overnight. Although, trail is naturally very beautiful. Enjoy the panorama.It was another trade route in ancient period. From Dharmasala you can see view of Larky peak and Naike peak. Afternoon you have time, so hike up to 300m-500m for acclimatize. If you feel headache because of Altitude, we recommend you Garlic soup. Today you have long walking day with Larkey pass. Early in the morning get ready for breakfast and climb up to Larkey pass.It takes to get Larkey pass 4-5 hrs to from Dharmasala.After shortly crossing the pass you will see the awesome surrounding mt view of Annapurna II(7937m. ), Himlung (7126m.) 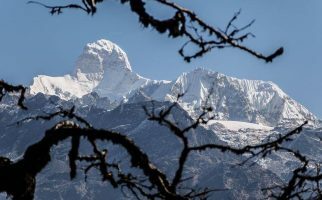 .Cheo Himal, Kanguru and other peaks (Larkey peak,Ratna Chuli,Gyaji khang,Namjung Himal).Then descent to Bhimthang through the snow screen and Grassy Moraine Rock fall area. At Bhimthang you will have nice lodge and delicious meals with Hot shower. On this day you have rest day after passing Larkey pass. Relax your tiredness or fatigue .Afternoon if you want you can hike to Ponkar Glacier.Bhimthang is very beautiful place surround by view of Mt Manasl (NE) ,Lamjung,Phungi,Himlung and Cheo Himal. Walk slightly downhill by crossing the Dudh Khola (stream) trough the Pine and Rhododendron forest with mt Panorama.On the way there are Guest houses for Lunch.Here is another kind of vegetation and People (Gurung).Before Goa you will see the view of Mt Manaslu. Walk to Dharapani 3 hrs approx through the Tilje.And drive to Besisahar along the Marsyandi River 2-3hrs bumpy Mountain Road.On the way enjoy the view of Tal, Rice field and Gurung Village.From Besi Sahar drive to Bandipur by private jeep 2hrs 40 minutes 60km approx highway. In the morning drive to Kathmandu 5hrs (147.6km) approx. Prithvi highway. In the evening Farewell dinner at Nepali culture Restaurant. We will drop to you International Airport.Have a nice your flight. Meals 3 times a day with Tea, Coffee, Hot chocolate, Hot milk and fruits during your Trek. Trekking Guide, Trekking camping cook and porters with their insurance.